Marshall’s solid state amps have reached a level of excellence that pretty much makes them the leader of the pack. Sure, we are all used to this brand being associated with heavy tube plexis, but these small cubes of pure solid state power have a lot to offer. Marshall MG Series MG15CFX is a perfect example of what we are talking about here. It is among the most attractive amps you can score for less than $200, and that goes for both its looks and its performance. If you are in the market for a capable practice rig, make sure to check this bad boy out. If there is one thing Marshall is always direct with, it is the controls on their amps. In some ways, MG15CFX is an exception to this unwritten rule. A simple overview of the knobs available reveals a rather saturated control cluster. You have your gain, three-band EQ, reverb, volume, FX knob and master volume. On top of that, you will also find no less than four different channels as well as tuner/tap tempo buttons. All of the knobs are labeled clearly in that standard Marshall fashion. FX knob is especially interesting considering it is used to activate four different effects as you turn it clockwise. First comes the chorus followed by a decent phaser, a flanger, vibe, and octave. Despite all of the mentioned effects, the core of this Marshall boom box is its raw tone. We are talking clean channel and the three subsequent variations of overdrive/distortion. Just the fact that you get four pretty unique channels to work with should tingle your curiosity. Marshall went ahead and modeled these after some of the more popular amps in their lineup. As its name states, this amp packs some 15 Watts of power. The cabinet is sturdy, tight and generally inspires confidence across the board. In terms of aesthetics, some will miss Marshall’s standard choice of colors, however, this brushed aluminum design absolutely looks gorgeous. 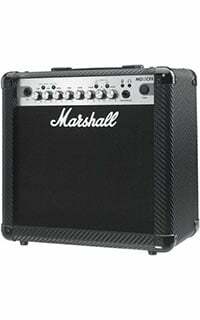 Overall, Marshall once again delivered a compact, reliable practice amp. Looks don’t sell amps, so let’s talk a bit about the tone you can expect to get from one of these. Cleans are somewhat more artificial compared to the usual Marshall stuff, but well within the limits of acceptable. Moving on to the crunch channel, you get a very warm and subtle overdrive that exceeded all expectations. Seriously, push that button and you’re in blues territory. OD1 and OD2 offer a varying degree of gain saturation. The latter one will be your default choice for heavier sound suitable for metal, while the former is aimed more towards rock. Tone-wise, MG15CFX is as solid as they come. Another great thing about this Marshall is just how loud it can be. With its 15 Watts, you can move some serious air. Our trust in Marshall to deliver a well-rounded practice amp at a competitive price has definitely paid off. Some might say that it is a bit bland and boring by design, however its raw nature is what makes it attractive. Perfect for home, you probably wouldn’t want to use this thing for gigging. It just lacks the power for a comfortable performance on stage. For more info about the Marshall MG Series MG15CFX, click here.